Our Anniversary Dinner : Nineteen Years! Hello hello! 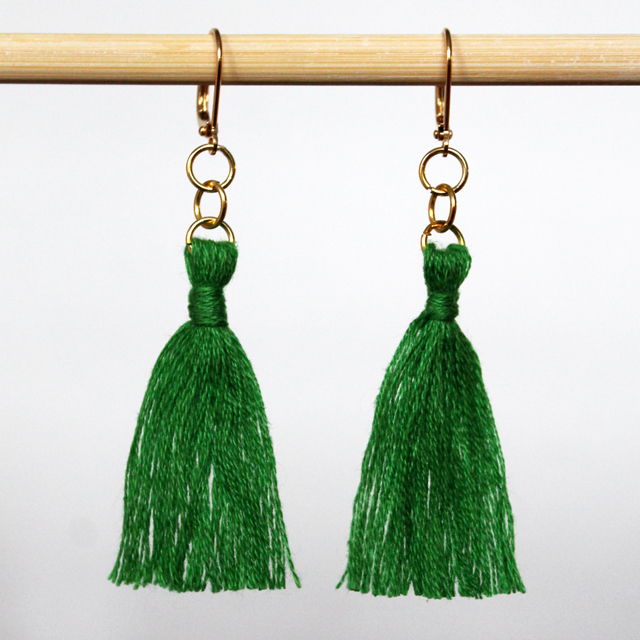 With December upon us, you might be wanting a pair of dangling earrings to accessorize your festive outfits. 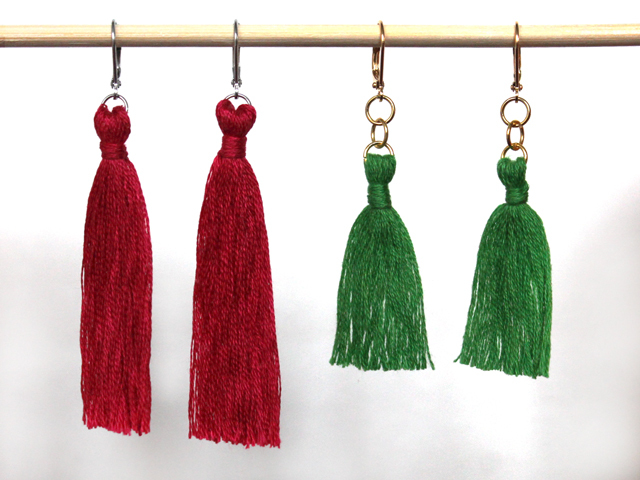 Today, I'll show you how you can make your own, in any colour you desire. 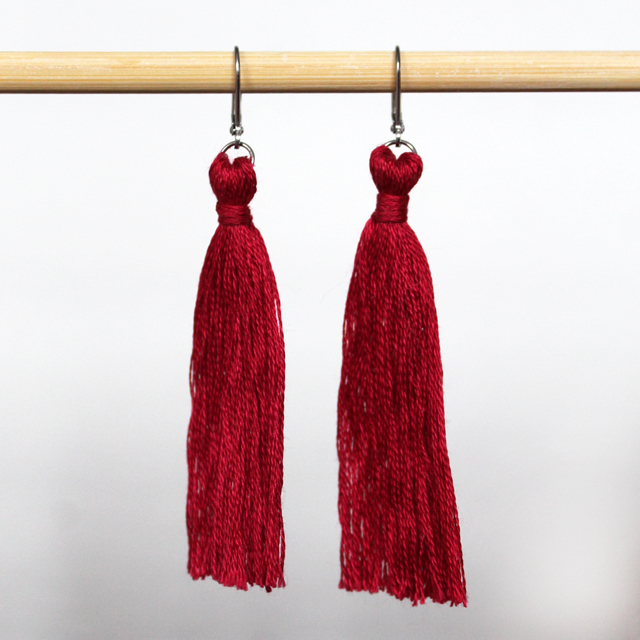 These tassel earrings are made with embroidery thread, resulting in all the drama of statement earrings, but none of the weight usually associated with them. They are feather light. In fact, you can't even tell you're wearing them. Well, that is until you look in the mirror or someone pays you a compliment. 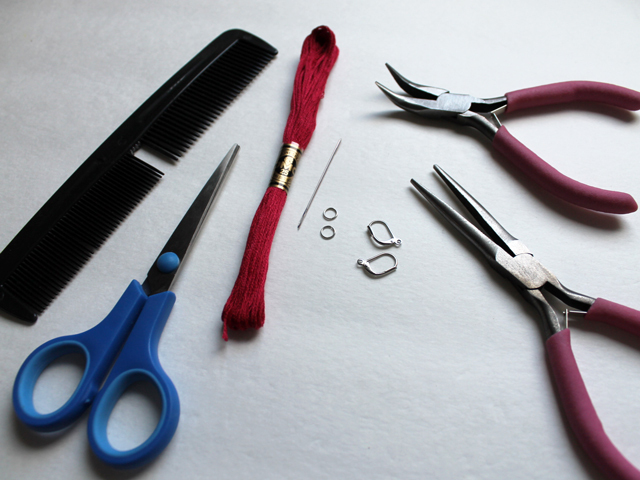 With the aid of a re-purposed (brand new, never used) comb, they're easy to make, although they do require the patients needed to work with tiny things. Each pair will take you no more than 45 minutes to make and cost under $2 in supplies. 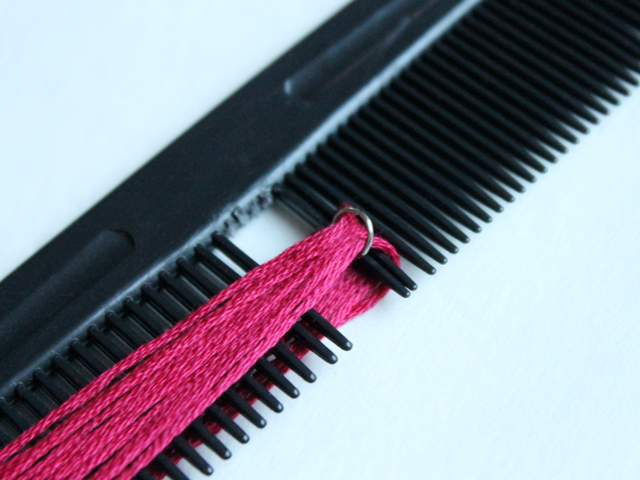 The comb is the same one I used to make ribbon gift toppers, in this post and in this one. It's one that came in a package of several when all I really wanted was one. 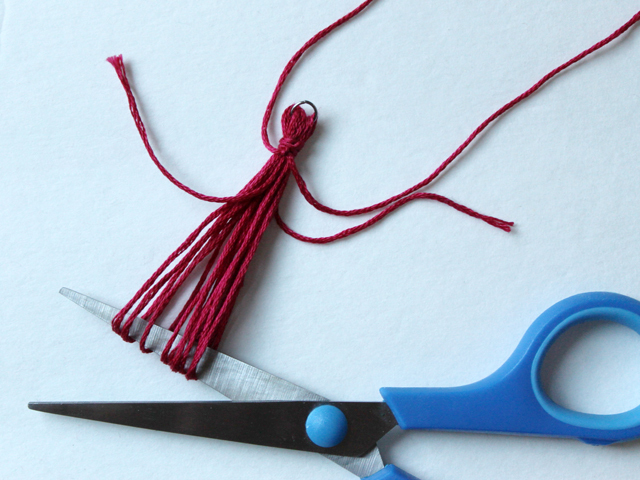 All you need to do is break off four prongs in the middle, to make it useful for making these small tassels and those other two styles of gift toppers. 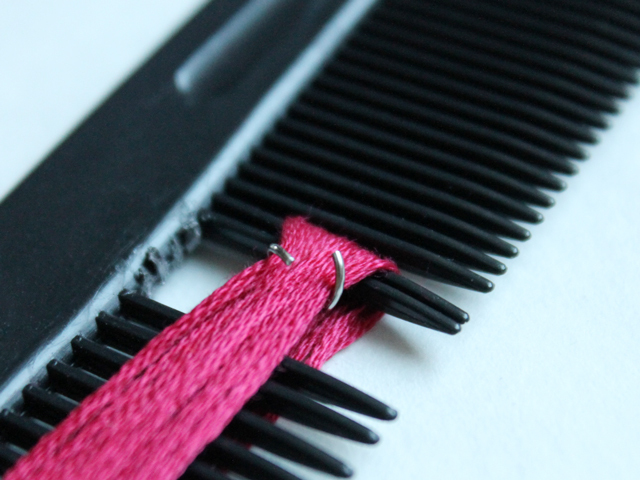 ↑ 1) Wrap the embroidery thread around the prongs of the comb, so that the space left by the broken off ones is at one end, making sure both ends end up at the bottom end, as shown in the photo. Make them as long and as full as you'd like. 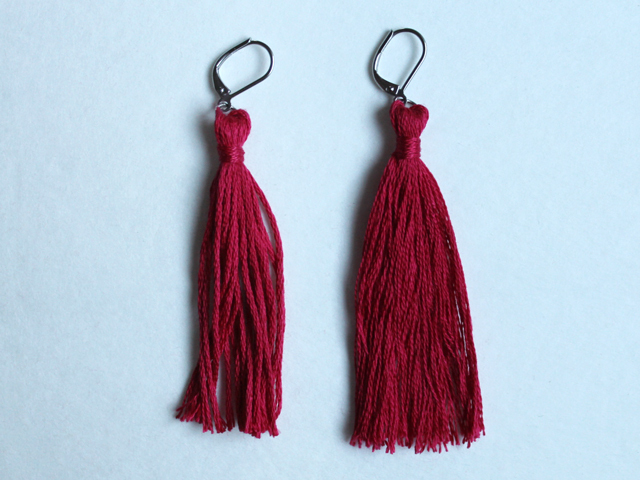 For reference, the burgundy ones shown here, are about 2 1/2 inches long, and the thread is wrapped 10 times. The green ones are about 1 3/4 inch long and the thread is wrapped 5 times. 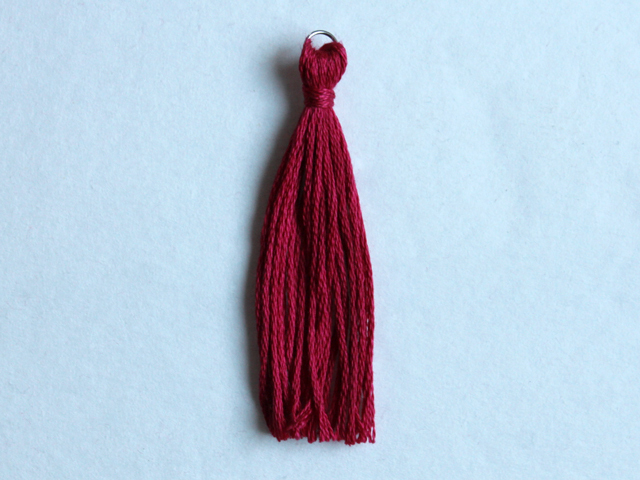 ↑ 3) Cut a piece of embroidery thread that is twice as long as the length of your tassels, plus a few inches (the ends of this will be incorporated into your tassel, so make sure it's long enough.) 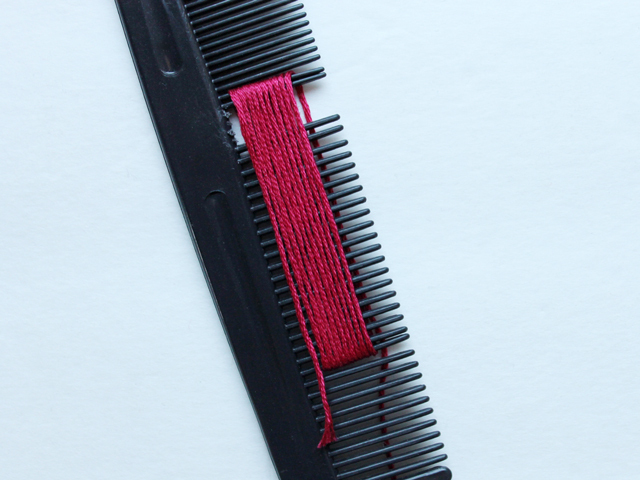 Going through the gap in your comb, wrap that thread around all the wrapped threads. Tie a double knot. ↑ 4) Remove from the comb. Wrap the piece of thread around a few more times and tie another double knot (if you know how to make a square knot, that looks best). 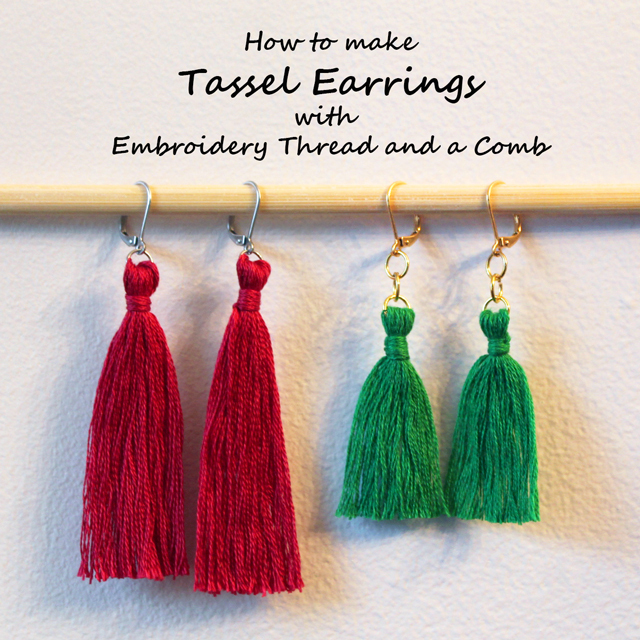 Make sure your two knots are on the same side, so you can make sure they're on the backside of your tassels when you attach the earring hook. ↑ 5) Cut the loops. 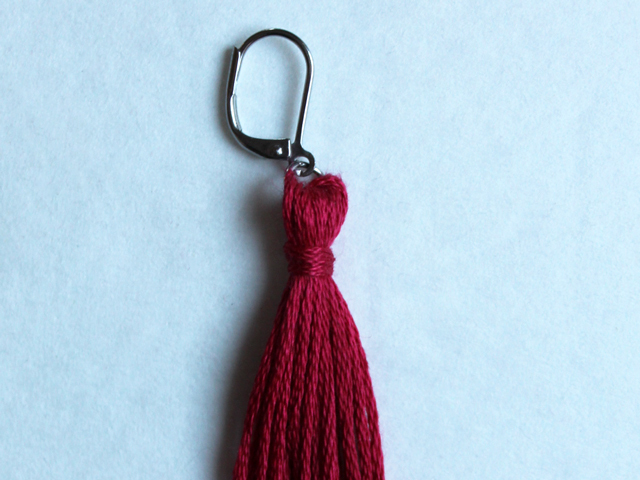 Since embroidery thread comes in skeins with inevitable kinks where they fold, check your tassels for those kinks. 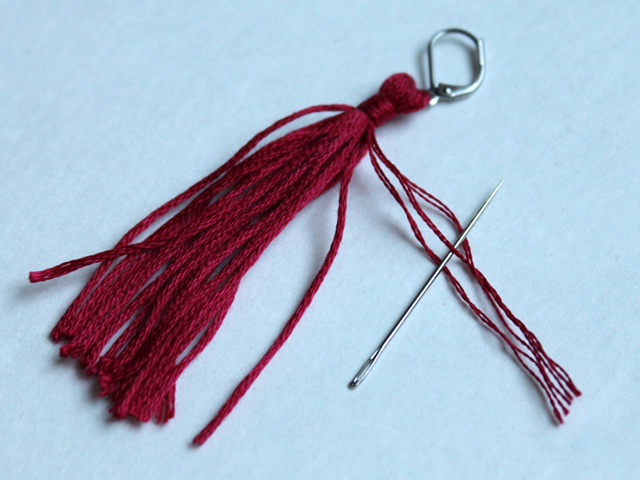 Remove them by wetting your fingers and pressing and gently smoothing the threads. The cotton should straighten right out. 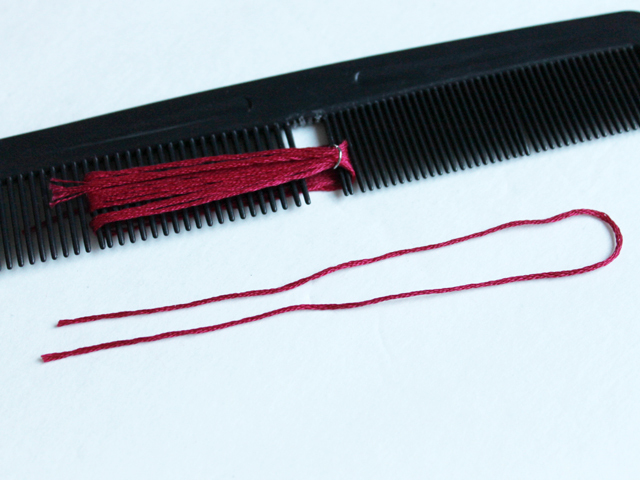 ↑ 6) Trim the ends. 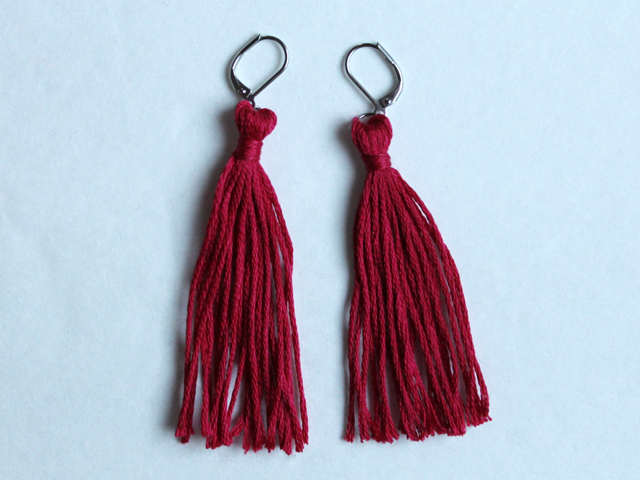 ↑ 7) Attach the earring hook, either by opening your jump ring a bit, putting it through the hole in the earring hook and closing again, or by opening the hole in the earring hook (most of them can be opened). Note, for the green ones, I added a couple more jump rings before the earring hook, which makes them a little bit more swingy (but still feather light). 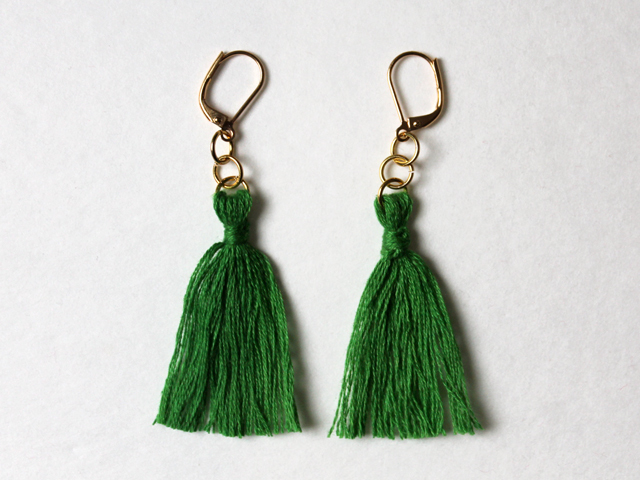 ↑ 8) Make a second earring. 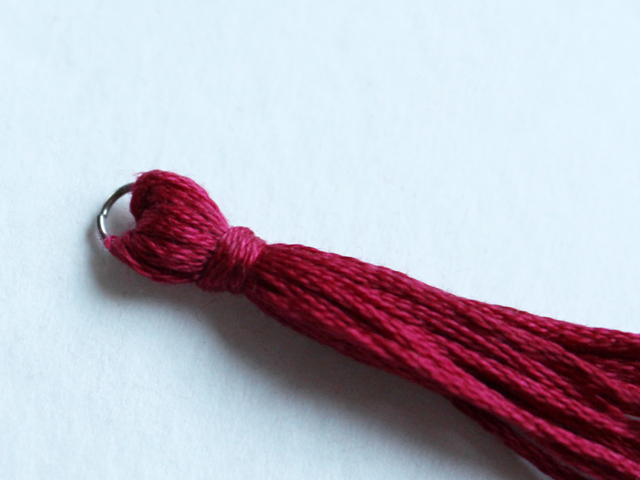 ↑ 9) Using the sewing needle, gently separate the individual strands (embroidery thread has 6 strands). 10) Trim again, if needed. I hope you try making a pair or two. This might be a good thing to do with friends or at a teen's birthday party.